We brought our couch with us when we moved into our house . . .
but it didn't match the living room's color scheme of taupes and browns and golds. I used a neutral slipcover as a temporary solution, and . . .
four years later, the "temporary" has turned into permanent. 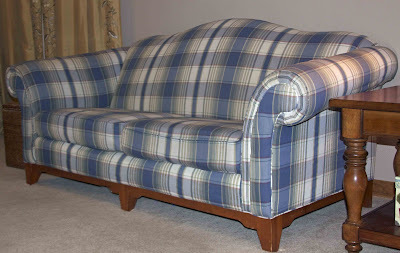 I succumbed to a New Year's Day blowout sale at the furniture store and bought a new sofa. It's not the gorgeous Victorian style damask-covered divan to which I am so richly entitled, but hey! I have 4 kids and a dog. Our new couch is sturdy, comfy, and MOST IMPORTANTLY . . .
doused in a gallon of Scotchgard. Nice couch! We bought new couches when I was pregnant w/ my oldest. We bought leather in a color called 'wipe off brown' - figured with a color called that we couldn't go wrong, lol! BTW, have you read Moose on the Loose? It's a very cute kid's book. It's set in Maine, but I kept thinking about you w/ your moose pictures when I read it. Love it! Good for you for getting something you wanted! We bought ours just before I few up for moms surgery. It's so much more comfy than the RV dinette couch. Our cushions are a bit darker but they both look really nice. LOVE it. Very nice! 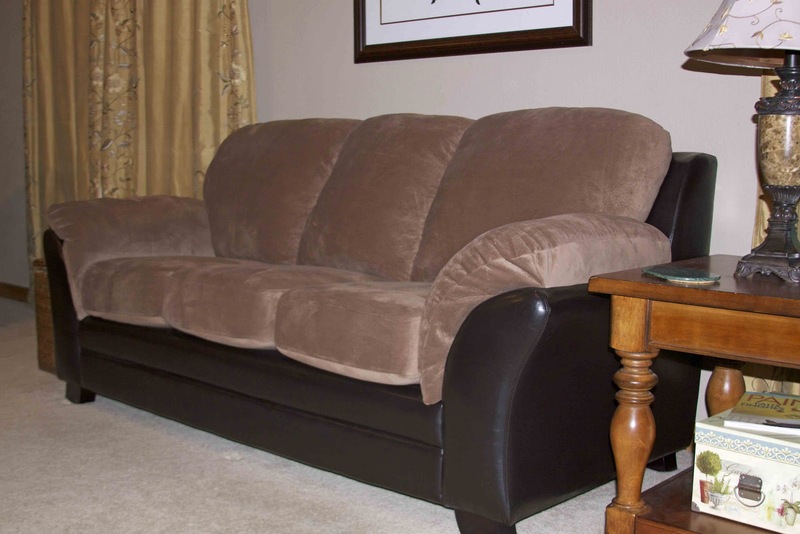 Did you find your slipcover slipped around a lot. It is beautiful and the Scotchgard was an even better investment than the couch itself! That's really similar to my couch. Only mine is one of those L ones because we have more kids than God intended for one woman to have. I love it. Very nice. 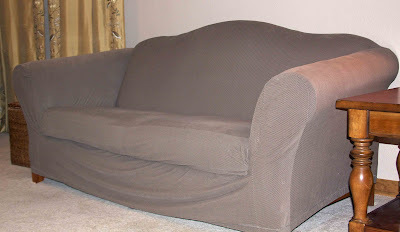 A fresh start with your couch : ) The year can only get better from here! Great minds think alike, Mrs M! Steph--surprisingly, the slip cover was a good fit and didn't slip much at all—the sofa was fabric (not a slippery leather) and the cover is actually 2 pieces (the seat cover is separate, so when you sit you don't pull on the entire thing). They're gorgeous!!! I had a hard time visualizing what they were going to look like. I love them! It looks so nice and comfy!!! And the scotchguard...very smart move! Oh, hey I was watching Sarah Palin's Alaska the other night and they were camping. At one point, they were all saying goodnight to one another and you could hear crickets chirping but it wasn't even dark out yet. Then Sarah said something about not waiting any longer to go to bed since it would never get dark. This may be a really stupid question but in the winter time does the sun not set in Alaska? Helene, I think it's the other way around, in Alaska it can be dark all day in the winter and light all night in the summer. On the other hand, maybe you're right, if the sun doesn't come up in the winter then it surely doesn't set in the winter either!